Local Band from Rutland, VT US currently Active. "We are Crypitus from Rutland Vermont. Our message is simply a fast paced thrash metal feel with a death metal overtone. Formed originally in 2015 by Dougles Friend and Logan Hayes. Shortly divided by personal issue Crypitus was set on hiatus until May of 2016 it was reformed by Doug Friend, Peter Snee and Zach Patch with the later addition of Hunter Nelson. The old songs reinvented and the sounds run with much more force. Since then we played an arsenal of shows in MA NH and VT included the famous Nectars in Burlington Vermont. The group continues to thrash about their heavy message of the dystopian land we live"
<br>"We are Crypitus from Rutland Vermont. 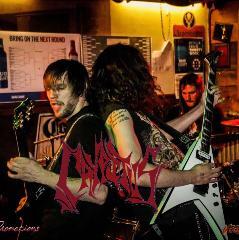 Our message is simply a fast paced thrash metal feel with a death metal overtone. Formed originally in 2015 by Dougles Friend and Logan Hayes. Shortly divided by personal issue Crypitus was set on hiatus until May of 2016 it was reformed by Doug Friend, Peter Snee and Zach Patch with the later addition of Hunter Nelson. The old songs reinvented and the sounds run with much more force. Since then we played an arsenal of shows in MA NH and VT included the famous Nectars in Burlington Vermont. The group continues to thrash about their heavy message of the dystopian land we live"